Which version of mechjeb are you using? 2.0.x is a prerelease, and I think it has some sort of automatic maneuver node thing. Never tried it but it could be problematic. Don't know about 1.9.8 though. I guess try uninstalling either? There is a possible fix for this in the MechJeb thread. I'm having trouble placing flags, I can't do anything to affect the orientation of the flag. The Kerbal always turns and plants the flag in the same direction. I did have fun with the "External Command Seat" and a poorly designed lander though. Tried the mechjeb fix, now it just warps me directly into the mun. I think it fixed the prediction but now ignores the closest approach setting. Same as before the fix it's easy enough to just get my probes into munar orbit once the hohman transfer is burned. 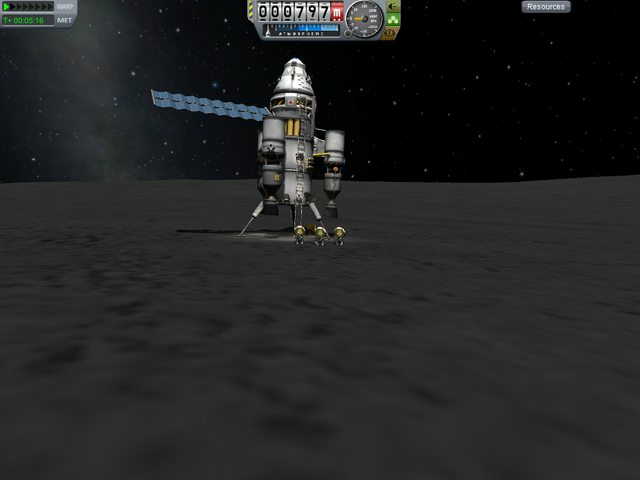 Also, second try for munar landing worked better than the first. Lander still sploded but was slow enough that my kethane miner/processor rover is upright and ready to go. I almost made it to the mun earlier... Ran out of fuel and ended up escaping kerbin orbit and now have a probe in orbit around the sun which was ment to land on the mun... That said I might have had enough fuel if I hadn't accidently detached the solid fuel boosters before they ran dry. Also I have a Kerbal stranded in a near perfect orbit around Kerbin because again I ran out of fuel and it wasn't supposed to orbit but come back down again instead. Problem 1: What problem? The mission parameters said the Mün, but that was obviously a ruse to distract the enemy! The real goal was putting it in a solar orbit all along! Problem 2: Yeah. On the bright side, now you get to practice rendezvous and save that poor Kerbal! Tip for a low grav lander, the trv-200 stack bi-coupler (the thing with 1 top connector and 2 bottom ones) makes a great short stack nuclear engine pod. Stick the nuclear engine on one bottom port, a FLT-200 or 400 fuel tank on the other port, and an RCS tank and thruster on the top port and you've got an all purpose interceptor/lander engine pod that can connect low on the lander frame without interfering with landing gear. Just connect the side of the fuel tank to your lander and keep it symmetrical. Now, does the thing have enough fuel to bring them back safely? My first try with the KSP demo didn't go so well.... I just wanted to go up then come straight back down. I went up, de-coupled the launch stage, and released the parachute. I went to high and was coming down too fast and the parachute snapped. Ooops. ... don't use the physichs warp, fool. there's a reason there's a warning. I don't remember if I did..... I meant hit the ground at 400 m/s. =P I think i'll try again later. This time I'll save some fuel to slow my descent before I decouple. Oh, will it? Good. I thought maybe I was going to fast for the parachute so when it caught and expanded the force was to great so the connection snapped or something. I dunno, I'm a KSP noob. You need to be going under 10m/s. Under 5m/s is best if you're nozzle landing. Of course the real best is touching down sub 1m/s, but that takes a lot of practice. Ok, good to know. Actually, I forgot to add a decoupler between my landing stage and the pod. Although I plan on adding landing struts instead. Have any of you seen Jebediah Kerman in orbit around the Mun? Trying to place the crossbow on Minmus now. Objective is to get out of a planets influence without jetpacks. Thanks to Leth and anyone else who watched the stream tonight! The crashes were plenty and the bugs annoying! Tonight I got the interplanety core into orbit, ironed out the bugs with my launcher, and planned out the rest of the ship. Tomorrow I want to get the crew habitation and a few of the propulsion drives docked and ready then plot my multi-planet flight plan. Viewer input will be heard and likely listened to as I am next to clueless with all I'm doing. Next stream will be tomorrow at about 8:00pm - 9:30pm EST. I hope to see some more viewers next time around! I don't watch LPs, more fun to just play. I just spent two hours screwing around with parts from spitfire, hexcan, B9, home, mechjeb, and lazors making various drones. Mainly sticking electric propellers on top of hexcan RTGs and making little helicopters with lazors on them. Crowning achievement is a home admin module, RTGs, propellors, and jet engines in a drone that can hover literally forever at a pretty decent altitude, beaming fuel as needed. I've learned a lot from let's plays. I would know nothing of tekkit otherwise. I remember the first time I played tekkit I spent like 2 hours figuring out how to get conductive pipes to work. I watch scott manley's mod spotlights, those usually give me all the into needed to make a mod in KSP dance for me. Though the forums gave me the idea of adding the extraplanetary launchpad's ore mining code to kethane drills. Much nicer looking and my resource gatherer only needs a single drill to get anything it needs. I wouldn't even have heard of Tekkit without let's plays. YouTube introduced KSP to me as well. Anybody watch HOCgaming?